Buildings play a significant role in climate change mitigation. In North America, energy used to construct and operate buildings accounts for some 40% of total energy use, largely originating from fossil fuels. The strategic reduction of these energy demands requires knowledge of potential upgrades prior to a building's construction. Furthermore, renewable energy generation integrated into buildings façades and district systems can improve the resiliency of community infrastructure. However, loads that are non-coincidental with on-site generation can cause load balancing issues. This imbalance is typically due to solar resources peaking at noon, whereas building loads typically peak in the morning and late afternoon or evenings. Ideally, the combination of on-site generation and localized storage could remedy such load balancing issues while reducing the need for fossil fuels. In response to these issues, this paper contributes a methodology that co-optimizes building designs and district technologies as an integrated community energy system. A distributed evolutionary algorithm is proposed that can navigate over 10154 potential community permutations. 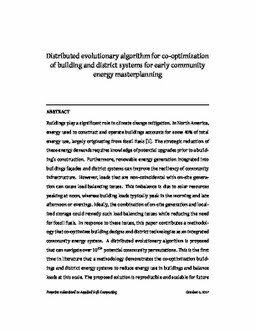 This is the first time in literature that a methodology demonstrates the co-optimization of buildings and district energy systems to reduce energy use in buildings and balance loads at this scale. The proposed solution is reproducible and scalable for future community masterplanning studies.